My kids love animals but unfortunately their parents aren’t pet people, well at least for now. To help fill the pet void in my children’s lives I try to get them some fun pet toys for their birthdays or for Christmas so they can enjoy pets without the mess or extra expenses. 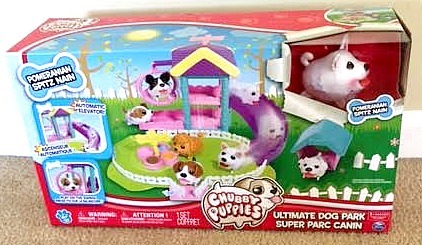 While looking for Christmas toys for this upcoming year I came across the Chubby Puppies and in exchange for my honest opinion I was given their Ultimate Dog Park Playset. One of my favorite things about the Chubby Puppies dog park is the colors. It is so bright and playful. There are also some fun features about the dog park that make it more unique and fun for the kids. When you open the Chubby Puppies box these are the items that will be inside, so there is a little bit of assembly required. It took me only about five minutes to put everything together. One of the best parts about assembly of the dog park is the fence. At first I was confused that the straight fence pieces were going to fit into the round insert but I was surprised and happy to find out that the fence pieces easily bend to fit into place. This is what the ultimate dog park ends up looking like. 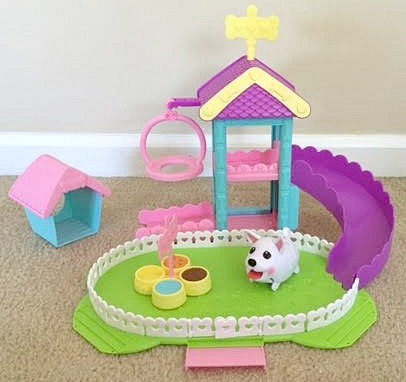 There is a swing, an elevator (that can never loose power because it does not require batteries), a slide, a spinning food dish, a dog house and a gate. 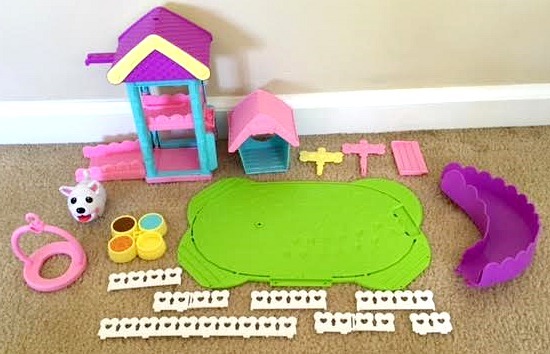 I love how the whole toy doesn’t take up a lot of space but it includes a lot of great features. I also love the Chubby Puppies and how cute they look when they are moving around, this has become one of my son’s favorite toys and he will carry it around the house all day long so we have gone through a few batteries with it already. This would be the perfect gift for any dog loving child and you can even buy more Chubby Puppies and start a Chubby Puppies collection! Who in your house would love to get Chubby Puppies for a Christmas gift? Which Chubby Puppy would they like the most?